Inventory We are a resale marketplace, not a box office or venue. Ticket prices may exceed face value. This site is not owned by Clowes Memorial Hall . 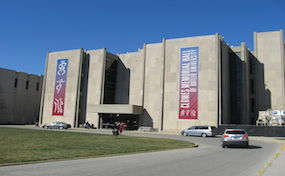 Clowes Memorial Hall located in Indianapolis, Indiana, has a seating capacity of 2,096 and was built in 1963. The facility has undergone numerous restorations because of the climate and snow berating the exterior and frame of the building. The most recent was in 2002, which included new paint, replacement chairs, and improved lobby facilities. Adam Lambert recorded his Glam Nation Live DVD at this venue in 2011 and it is frequented by the Indianapolis Symphony Orchestra. The Clowes Memorial Hall Box Office is located at 4602 Sunset Avenue, Indianapolis, Indiana. MemorialHallIndianapolis.com is a privately held company that specializes in the sale of tickets in the secondary market. We are not affiliated with any official supplier or box office. To purchase tickets to any Clowes Memorial Hall in Indianapolis events simply call our operators at anytime or click on the event you wish to attend.